When my husband, Matt, and I were first married, we moved from our home on Long Island and lived in West Chester Pennsylvania. It was a nice village to start a life together. We had jobs to begin our budding careers. West Chester State College offered me a graduate program to complete my certification. We rented a ground floor apartment of a duplex a few blocks from campus. There was a small yard and back alley to park the cars and put out the trash cans. One end of the alley led to a small delicatessen on the next street. T&R’s was a narrow store with a screen door that allowed in the only natural light. One long wall was lined with shelves from ceiling to floor. It held sodas, cleaning products and stacks of canned hash, Dinty Moore Beef Stew and Campbell Soup with faded labels. Were expiration dates on non-perishable foods mandatory in 1980? On the very top of the shelf sat dusty boxes of Pampers, paper towels, and toilet paper. Their labels were also faded. Thinking back, I wondered how anyone was expected to reach up there. On the opposite wall, perched Ted, the T in T&R,—a rather large man sitting in an unseen chair. He seemed to be wedged in by a short counter cluttered with newspapers, gum, chewing tobacco, and cigarettes. No matter the temperature, a creaky fan aimed its breeze on his sweaty head and round pasty face that continued past his neck. He had the palest blue eyes I had ever seen behind thick horned rimmed glasses. Ted uttered an obligatory “Evening” to customers walking through the screen door, without breaking his gaze from a black and white TV mounted in the far corner of that wall. Beat The Clock game show played through grey static and hushed volume. Beyond Ted was a long glass deli counter. It was lined with the scrapple, ham, pressed chicken breast, salami logs, and cheeses. Behind the counter, stood Rosie, the R in T&R. Rosie was a short, stout woman. She wore a white apron over a flowered house dress. Her dark eyes look out from the same style and thickness as Ted’s glasses. Her hair was crop short and dyed in a flat black shade. Rosie spoke through the side of her mouth with a thick tongue that was probably reminiscent of a stroke. She smiled her crooked smile and directed her queries to Matt (who, at the time was very cute) “What can get for you tonight, honey?” On Friday nights Matt and I liked to share a hoagie. We were far from our native Long Island. Pennsylvania could not compete with our pizza and Chinese take-out standards. But Rosie’s hoagies exceeded any New York hero. Hoagies were long sandwiches filled with meats and cheeses, and other additions and condiments. We grew up eating Long Island heroes made in the corner delis. During our college days, we ate upstate New York submarines. West Chester Pennsylvania was outside of Philadelphia, home of Philly cheese steak sandwiches and hoagies. There was never a long line at T&Rs but a customer or two could be waiting their turn. The place was never empty. Rosie took pride in customizing each of her hoagies. When the hoagie was complete, Rosie took the top of the roll and pressed it on top of her masterpiece standing on tiptoes to get some leverage. She wrapped the hoagie and cut it in fourths. We had plenty for dinner and lunch the next day. We had to interrupt Ted from the riveting excitement of Beat The Clock to pay. For three dollars, a T&R hoagie was the best deal in town. These days, now and then, Matt will order a hero from our local Long Island deli. A team of counter people bustle quickly and gets orders to customers efficiently. The art of waiting is lost. A hero is complete in less than three minutes. They are not quite a monument nor built for two meals for two people. There are seldom conversations about sandwich origins, and the counter clerk does not call Matt honey. 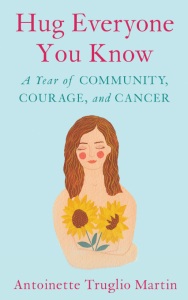 Antoinette Truglio Martin is the author of Hug Everyone You Know: A Year of Community, Courage, and Cancer. The memoir is a wimpy patient’s journey through her first year of breast cancer treatment. That’s an awesome story My daughter went to Westchester and lived off campus there. Small world quiet town. She loved it ….